Soybean production is intensifying across Western Canada, and for producers, managing herbicide-resistant volunteer canola populations can be challenging. Volunteer canola is one of the top abundant weed species in Western Canada and can be very competitive in all soybean crops. However, researchers have identified weaknesses in the volunteer canola life cycle that can be exploited to manage this weed, and have developed management strategies to help producers grow crops in rotation effectively and profitably. Rob Gulden, associate professor at the University of Manitoba, and graduate students Charles Geddes and Paul Gregoire, conducted a number of different studies over the past few years to address the challenge of managing this herbicide-resistant weed. They studied a range of agronomic management practices that could be implemented in an integrated weed management (IWM) program at different life stages of volunteer canola to reduce the seedbank numbers and crop impacts. The results of inter-row tillage as an approach showed that although it was not a perfect solution, inter-row tillage did work reasonably well, particularly in wider row spacing. An assessment of living and terminated mulches, both spring wheat and winter cereal rye, were effective at reducing volunteer seed production in soybean without affecting soybean yield relative to without the mulch controls. Unlike rye, living spring wheat mulch developed into an intercrop and produced additional wheat yield at soybean harvest. Overall, IWM techniques were more effective at locations with high densities of volunteer canola seedling emergence. Researchers also used digital image analysis to see if they could find a relationship between early season total ground cover with increasing volunteer canola densities and soybean yield loss in narrow- or wide-row soybean. The study showed that digital image capture early in the season was effective at predicting soybean yield loss. However, various factors such as soybean row spacing, crop and weed developmental stages at the time of image capture and others suggest that a single, universal yield loss model applicable to all situations may be challenging to develop using early season ground cover data only. Gulden notes the project also considered herbicide options for managing volunteer canola in soybean, including collaborating on studies led by Chris Willenborg at the University of Saskatchewan, and separate trials with Xtend and Enlist soybean varieties. Overall, the results showed there are a number of herbicides with various modes of action that are effective for in-crop management of volunteer canola in soybean. 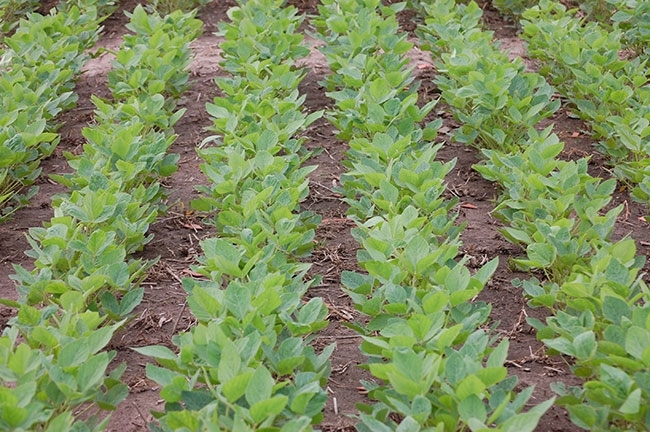 Herbicides with faster acting modes of action were more effective at preventing soybean yield loss, particularly when volunteer canola was developing quickly at the beginning of the critical period of weed control in soybean. Xtend and Enlist soybean varieties required an in-crop herbicide effective on volunteer canola to maximize volunteer canola control and soybean yield. In both systems, the best herbicide choices were not always consistent among and locations and years and appeared to be influenced by the developmental rates of volunteer canola and soybean.